St Paul’s N.S. is a two teacher co-educational primary school under the patronage of the Church of Ireland, committed to attaining the highest possible academic standards according to each pupil’s potential and to enhancing the holistic development of all pupils. “The school is a community where moral values such as honesty, truthfulness, justice, fairness, sensitivity and responsibility are nurtured and protected” (School Ethos Statement). The building was built in 1976 and was totally renovated in 2009. The school is specifically designed and resourced to cater for wheelchair users. 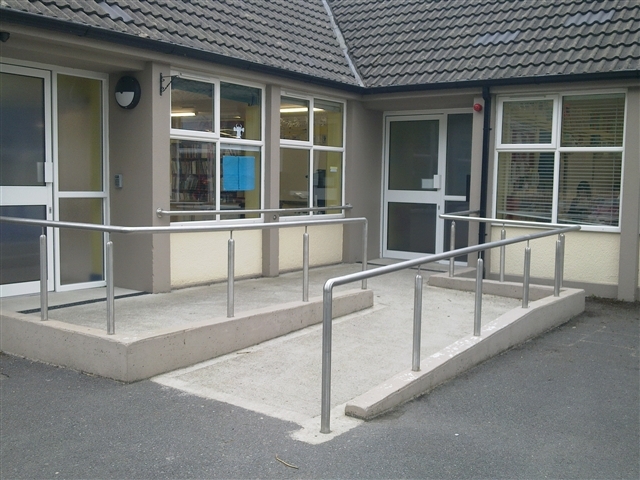 The school building is universally accessible with ramps to all entrance doors. There is a spacious, fully furnished, universally accessible toilet complete with changing bench and lifting hoist. There are strong connections between the Mountmellick Group of Parishes and the school. The school participates regularly in church services where pupils have the opportunity to help to lead the worship. Assembly is held every morning when the whole school comes together for hymn singing and prayer. The Church of Ireland ‘Follow-Me Programme’ is the main R.E. programme followed in the school alongside the Postal Bible School. Pupils are given the opportunity to participate in many local and national art competitions. Each year, the pupils have the opportunity to make a piece of Mountmellick Work in time for Mother’s Day. It is endeavoured that pupils in the school are exposed to as many areas of Physical Education as possible. Pupils complete a certified six-week course of swimming lessons each year. Pupils in the Junior classroom experience a course of Irish dancing each year. Pupils also attend gymnastic classes in the local gymnastics hall as well as athletics sessions organised by Laois Sports Partnership. Each classroom is equipped with an inter-active whiteboard and a teacher laptop. There are twelve laptops in the schools for pupils use. Pupils enjoy the advantage of extensive playground areas including grass pitches and tarmacadamed courts. Each classroom has a vegetable patch outside their classroom window, which the pupils get to attend to in the Spring. A salad party is enjoyed each Summer. As well as enjoying the strands of the music curriculum, pupils in the Senior Classroom are given the opportunity to learn the recorder. The end of year musical is a real highlight for the whole school community. The school has been awarded the DPSM Plaque for Science and Maths Excellence for the fourth year in a row. The school is well resourced for all curricular areas with interactive whiteboards and laptops. Currently there are Special Needs Assistants employed in the school. Currently there is a Special Education Teacher based in the school. Intention to enrol forms are available from the school. Any prospective pupils and their families are welcome to contact the school and arrange a visit.